Are redheads REALLY this common in Japan? Just some first impressions upon seeing episode 1 of Uta no Prince-sama: maji love 1000% (Princes of Song: magic love 1000%). As I mentioned before, the OP did not make me happy; it is less a song, and more a way to feature several personalities. Nevertheless I ended up checking it out because Caraniel considered it entertaining for two big reasons 1) hilariously campy, and 2) great seiyuu cast. And of course, she was right. These two factors intersect at the point that Norio Wakamoto’s character makes his entrance, which was ridiculously entertaining. Now my temptation is to say, “this made no sense,” and, “that made no sense”. You know, things like, “What the hell are his wires attached to, if there is nothing but sky above him”? Or “The scions of financial groups don’t face off as rival pop stars; they go to business school, not performing art school”. Or even, “Cats don’t steal handkerchiefs, then lead you out into the night where you meet brooding bishies.” But I won’t. The point of this show is not to be well written, or have a clever plot. Plot here is merely a device for moving from one kyaa-producing character interaction to the next. In fact, I would say that the courage to insert any random idea just to turn up the kyaa factor is one of this show’s strengths (you don’t get to 1000% by sticking to ideas that make sense). Okay, but what if you aren’t drunk, or 12 years old? This might be good for a few laughs, but is there anything more substantial? I really do like the idea that the main character is studying to be a composer. That is a somewhat unusual ambition, and it is kind of cool that the main girl wants to work behind the scenes instead of being a pop idol herself. At this point there is little reason to believe that they will make much of the real work that is required to become a composer, but I still think it makes her unusual. In the end, I wouldn’t put money on this being a good to great show, but it might be ridiculously entertaining. I agree that it deserves credit for having a heroine who prefers to work behind the scenes instead of being an idol herself…. 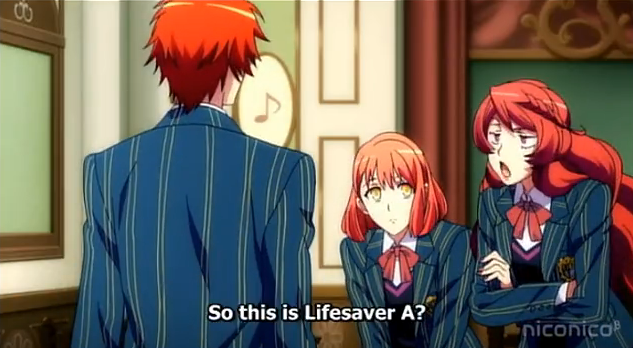 HOWEVER, it’s reverse harem, so most likely she’ll be more concerned about the bishies instead of composing later. Yeah, I don’t expect them to tackle anything serious. It *is* cool that she wants to be a composer, however. Someone should do a serious show about that sometime. You would doubt my impeccable judgement for a second!? Hahaha!